Heat Wave Expected to Peak Today. Equatorial Pacific in Transition. Temperatures today at Los Angeles Pierce College in Woodland Hills appear to be running about a degree hotter than yesterday, when a new record high for the date of 109°F was recorded at the campus weather station. A BUFKIT analysis of 12z data for Van Nuys shows temps peaking today at about 107°F, followed by a slow cooling trend into next week, with high temps dropping down into the high eighties. 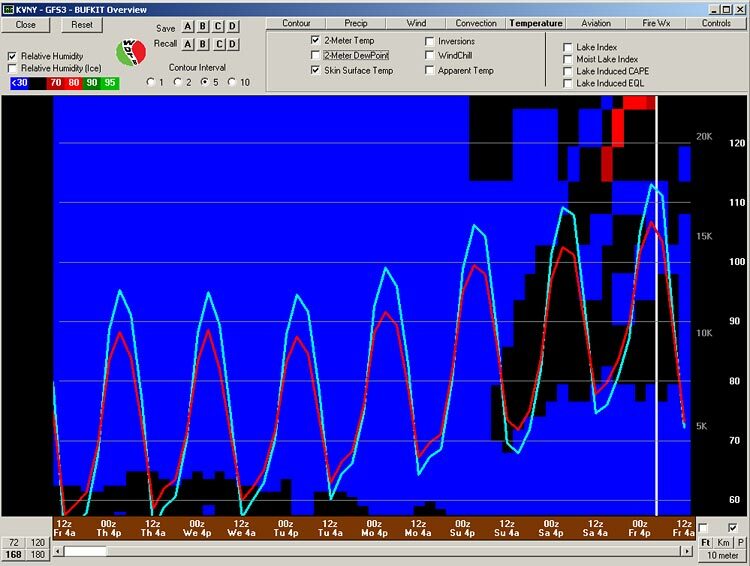 In this graph of temperatures, the red line is the 2-meter temperature and the blue line is the surface "skin" temperature. Equatorial Pacific SSTs continue the transition to neutral conditions. 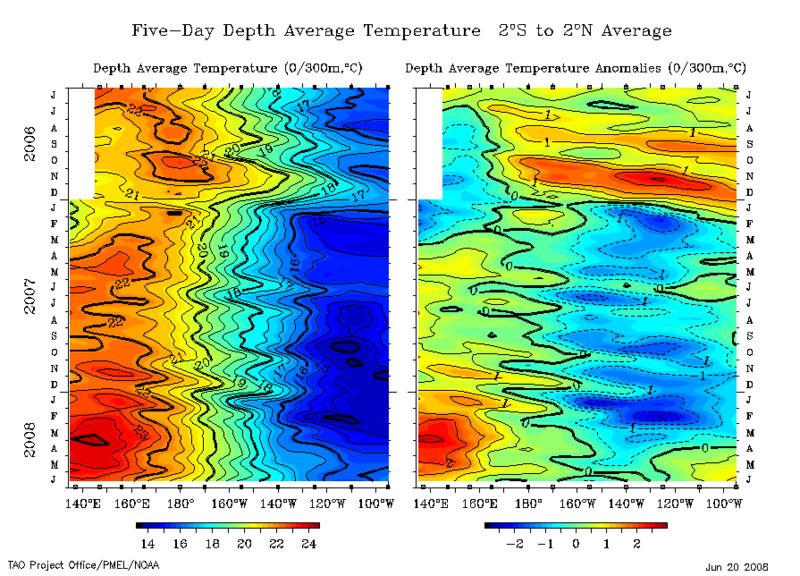 This TAO section plot of 5-day Depth Average Temperature clearly shows the change in state with a marked increase in sub-surface temperatures, particularly in the far eastern and western equatorial Pacific. 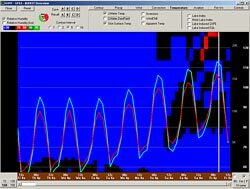 It looks like Downtown Los Angeles (USC) will end the July 1, 2007 to June 30, 2008 water year with 13.53 inches of rain recorded. This is 91% of the 1921-2006 average of 14.87 inches. Update Monday, June 23, 2008. On Friday, Los Angeles Pierce College in Woodland Hills eventually reached a record-setting high of 111°F! Here is an archived copy of a NWS Los Angeles/Oxnard Record Event Report listing record highs from around the area for Friday, June 20.